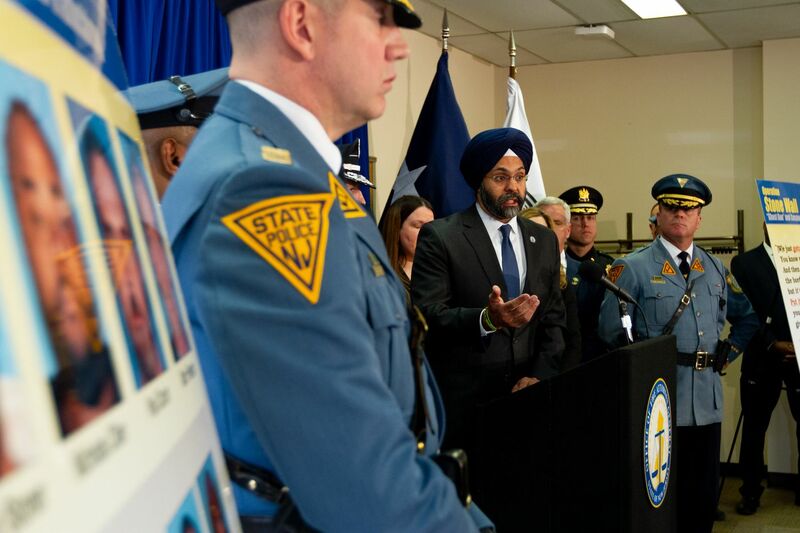 New Jersey Attorney General Gurbir S. Grewal speaks at news conference at Camden County Police Headquarters in Camden, N.J., Monday, March 18, 2019, announcing the takedown of a "ghost gun" ring trafficking in untraceable AR-15 assault rifles that buyers can finish assembling. At a news conference in Camden, state and local officials said some of the men were the first to be arrested under a new state law criminalizing the use of “ghost guns” built from kits sold online. The arrests were made between March 8 and Thursday, authorities said. The yearlong investigation by the Attorney General’s Office and the New Jersey State Police, dubbed “Operation Stone Wall," began as a probe of cocaine distribution centered in Lindenwold, and broadened to include guns, authorities said. Eleven of the 12 men arrested are from Camden County, including six from Lindenwold; one is from Gloucester County. Investigators originally focused on 43-year-old Lamont White and his 20-year-old son, Tyriek Bradford, who they called key members of a drug distribution network. Authorities said they later learned that Christopher Stoner, one of the alleged cocaine suppliers, also was involved with illegal trafficking of ghost guns. Stoner and three others allegedly conspired to sell six unregistered AR-15 assault rifles assembled using kits bought online. The guns then allegedly were sold for between $1,100 and $1,300 each. Gov. Phil Murphy signed a law in November banning the purchase of firearms parts used to make untraceable weapons, sometimes called “ghost guns.” In many states, they require no ID verification, date of birth confirmation, or background check. The investigation was not limited to New Jersey. During the probe, investigators learned of an alleged plan to circumvent the New Jersey law by having guns shipped to Bensalem, Bucks County. On Wednesday, investigators intercepted parts for two assault rifles ordered by two of the men for shipment to Bensalem, authorities said Monday. “This case starkly illustrates why ghost guns are so dangerous, because drug dealers and other criminals can easily acquire them and traffic them into our communities, where they will be virtually untraceable if used in a crime,” Attorney General Gurbir S. Grewal said. It is already illegal to sell assault weapons in New Jersey, but Jersey’s latest law forbids manufacturers from shipping the ghost gun parts into the state. So now, buyers are shipping them to Pennsylvania addresses, picking them up and carrying them over the Delaware River, where the ghost guns are assembled and sold. Manufacturers fabricate guns that are 80 percent built, and sell them online along with the parts necessary to fill them out. In some cases, they provide links to YouTube videos showing buyers how to complete them. A poster displayed at Camden news conference Monday morning shows 12 men arrested in takedown of alleged "ghost gun" ring. The build-it-yourself guns are untraceable because they are not assigned serial numbers and are not registered, authorities said. Kits available for most assault rifles and pistols usually cost a few hundred dollars and a gun can be built within a few hours. The guns are considered an affordable alternative to weapons that are legally distributed. In June, the Attorney General’s Office sent cease-and-desist letters to the manufacturers of the guns. Still under investigation are companies attempting to sell ghost guns or ghost-gun parts in New Jersey, authorities said. Grewal said the ghost gun manufacturers could face prosecution if caught shipping the guns into New Jersey. Repeat purchases should indicate that a buyer is not “an enthusiast or a hobbyist, but rather someone who is engaged in illegal trafficking,” he added. The six Lindenwold men arrested were: Christopher Stoner, 41; Paul Corum, 43; Lamont White, 43; Tyriek Bradford, 20; John Rayford, 41, and Mark Freeman, 53. Also arrested: Nicholas Cilien, 38, Mount Ephraim; Monroe Gadson, 28, Camden; Bryheem Belcher, 33, Magnolia; Fabian Sapp, 45, Sicklerville; Devon Davis, 31, Chesilhurst; Michael Smith, 48, Woodbury Heights, Gloucester County. Stoner, 41, Cilien, 38, Corum, 43, and Freeman, 53, were charged with unlawful possession of an assault rifle, unlawful manufacture, transport, shipment, sale, disposition of covert or undetectable firearms, among other charges. The other eight men were charged primarily with conspiracy to distribute cocaine. Correction: An earlier version of this article incorrectly reported that it is also illegal to sell assault weapons in Pennsylvania.